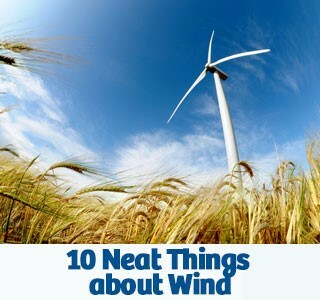 1. Who has seen the wind? Nobody. But you can sure feel it. Wind is caused by pressure differentials in the atmosphere. Air moves from higher to lower pressure areas, because low-pressure air is slightly less dense than higher-pressure air. The differential heat between the poles and the equator, and the rotation of the planet are the two main causes of major atmospheric air circulation. 3. Raining cats and dogs. While there are no recorded instances of cats and dogs being deposited in a gust of wind, there have been many reports of objects such as fish and frogs raining down in unexpected places. Theory has it that funnel-shaped winds scooped these animals up in one area and deposited them in another. Hot southerly winds off the lee side slopes of mountain ranges are sometimes called Foehn or devil winds. They dramatically raise temperatures in minutes, melting snow or causing fires. Anecdotally, people claim they cause all kinds of illnesses, including circulatory problems, headaches and psychoses. While this hasn't been scientifically proven, the phenomena are too prevalent to be dismissed out of hand. Little whirlwinds carrying dust and debris often spring up in flat dry areas under clear skies. When the surface of the earth gets hot from the sun, even though it may be somewhat cooler in the atmosphere above, it sets up a temperature differential between the surface air and that above it causing whirlwind-like air movement. These dust devils are generally weak and short lived, often carrying loose debris, including dust. In the middle east, Khamsin winds traveling up to 140 km per hour are sandstorms that occur every 50 days or so and generally last from a few hours to as long as a week. Khamsins interrupted Napoleon on his Egyptian campaign and forced the Germans to stop in mid-battle during the Second World War. The winds also caused electrical disturbances that interfered with compasses. 7. Flying in the wind. Birds have a number of strategies to keep themselves safe from the wind. Some will seek shelter on the lee side of trees or in thick hedges. Others, when sensing a storm, will deliberately make their way to a storm's calm eye; the danger here is that the birds are trapped without food or anywhere to rest for as long as the storm lasts. Others will take advantage of a storm, getting a speed boost from coasting on the leading edge. Eagles utilize rising wind currents to swoop and soar above the land. Wind has been used as a source of power forever. In the earliest days, wind powered transportation by water. Windmills have been harnessing the wind's power for millennia, reaching a pinnacle of efficiency in Holland. Wind has lifted balloons into the air and helped airplanes to conserve fuel and arrive faster or slower. Today, wind powers a lot of homes and businesses. In Canada alone, wind-powered turbines produced about 11.898 megawatts of power in 2016. That is up from 6,500 mw in 2012. Worldwide, China produces about 25 per cent of the wind power. The United States is number 2 and Germany is number 3. Canada currently ranks ninth. 9. The power of friction. Wind speeds are measured at about 33 feet (32.8 m) above the ground. This is because speed can be severely impacted by the friction caused by what it encounters. For example, wind measured as 13 knots at a height of 15 feet (5 m) above the ground, will have its velocity increase to 13.2 knots at 30 feet (10 m) above the ground, but would be measured at only 8.2 knots at three feet (1 m) above the ground. Differences in the roughness of the terrain can interfere with accuracy. Mysteriously, wind socks at airports are located 16 feet above the ground while the anemometers (wind measuring devices) are at the standard 33 feet. No matter how subtly it is done, humans expel wind caused by the act of digestion at least 15 times a day. Carbohydrates stimulate production. Carbonated beverages and swallowing air as we eat or drink are other contributors. Volumes range from 476 to 1491 ml per 24 hours. - Dorothy Dobbie Copyright© Pegasus Publications Inc.